This information is displayed for a few seconds when the ignition is switched on, after the service information. The level shown will only be correct if the vehicle is on level ground and the engine has been off for more than 30 minutes. 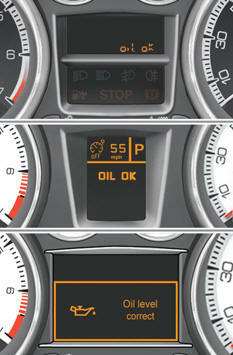 This is indicated by the flashing of "OIL" , linked with the service warning lamp, accompanied by an audible signal and a message in the multifunction screen. If the low oil level is confirmed by a check using the dipstick, the level must be topped up to prevent damage to the engine. This is indicated by the flashing of "OIL--" . Refer to the "Checks" section to locate the dipstick and the oil filler cap on your engine. - B = min; top up the level via the oil filler cap, using the grade of oil suited to your engine.